As many of you already know, we are best known for shipping balikbayan boxes. But did you know that we ship automobiles and motorcycles as well? In particular, this is one of the freight forwarding services we provide to returning residents, businesses and other organizations who are moving back to the Philippines. 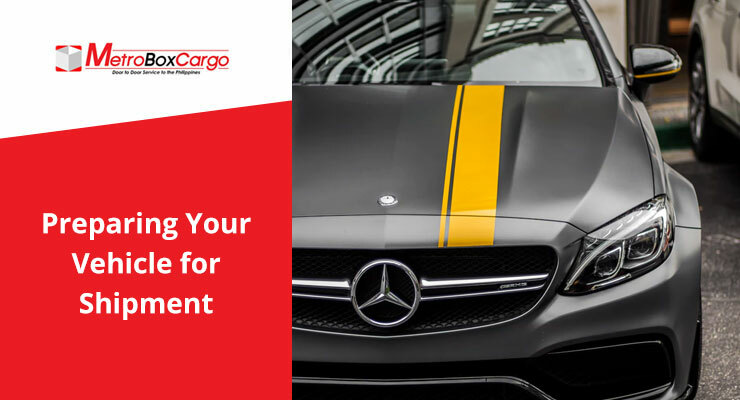 For those considering this service, we are fully aware and understand the enormity of your decision to ship your vehicle and costs associated with the service. Know that we always will ensure to bring the best care and service to your vehicle every step of the way as it reaches its final destination in the Philippines. Documentation and paperwork – We ask that you complete the documents as early as possible so we can prevent delays from port or customs officials and related agencies. We will assist you on any questions you may have when filling the different forms and we will take care of the rest. Check vehicle’s exterior for dents, scratches, and notable markings – Before shipping, thoroughly wash your vehicle both inside and out because this is the best way to expose all flaws, dents, scratches. Take photos of both vehicle’s exterior and interior – This is very important and remember to share these photos with us. They will also be included as part of the documentation package for your vehicle. If you are unsure what kind of photos are needed, we can set up an appointment and together we can document your vehicle’s exterior and interior – all dents, scratches, notable markings and customizations. Remove any exterior accessories such as roof racks, antenna, and spoilers so that they do not run the risk of damage during shipment. You can organize them (including the nuts and bolts, etc.) neatly inside plastic bins and subsequently store the bins inside your vehicle’s trunk or on the backseat. Take photos of these accessories as well and share them with us. Disclose and record any mechanical issues, especially leaks, and fix/repair them as soon as possible. Both the US and Philippine governments are very strict as both consider this issue as very hazardous and both will deny clearance. All security alarms are disabled. The fuel tank has only ⅛ full of gas maximum. All tires are fully inflated. If your vehicle is a convertible, make sure that the convertible top is secure. Whether or not to crate – this is an important consideration for motorcycles that are vintage collector’s items and/or especially customized versions. A special wooden crate is built to house and provide extra protection for the motorcycle. Make sure the keys are not in the ignition so the keys do not get lost while in transit. Battery – disconnect the wires prior to shipping, but make sure that the battery is in good condition. Make sure that the VIN number is visible and/or easy to access for customs officials. Make sure that the kickstand is not engaged so as not to compromise the motorcycle’s suspension system. In a nutshell, shipping your automobile or motorcycle can be an easy process provided you remember a few important and sensible things: complete all documentation and paperwork, ensure that your automobile or motorcycle is in good working condition, and take photos (many of them!) of the exterior and interior and share them with us. Lastly, if you are unsure of anything, contact us as soon as possible so we can avoid potential issues and delays. Before you know it, your automobile or motorcycle will have arrived safely at its final destination!